Kawah Ijen is a basaltic-andesite to dacitic stratovolcano located in the Banyuwangi Regency of East Java. 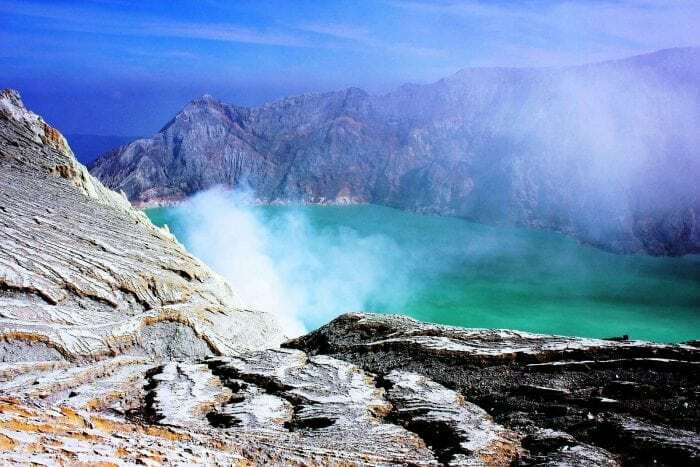 It represents the only remaining active volcano on the Ijen Caldera Complex and has a long history of eruptions, the last of which took place in 1999. In more recent years it has become somewhat famous for its illustrious rivers of blue lava, and the dangerous sulfur mining operation it supports. Characteristically of stratovolcanoes, Kawah Ijen has a large caldera (1000m in diameter) that hosts a lake. The hydrochloric gasses being constantly released from the volcano have reacted with the caldera lake, resulting in the lake having a pH of 0.4, making it the largest body of hydrochloric acid in the world (with a volume of 36 million cubic meters). The ‘blue lava’ found at Kawah Ijen, as described in a number of media sources, is actually rivers of ignited condensed sulphuric gas flowing down the side of the mountain. The gases originate from cracks in the volcano. They are released at high pressure, and at temperatures of up to 600°C, causing them to burn a bright blue electric flame. A large amount of the burning gas condenses, however, remains ignited, resulting in the apparent formations of blue lava rivers (which are in fact rivers of condensed burning sulphuric gas). The flow of burning sulfur gas is constant and represents the largest area of burning sulphuric gas in the world, referred to locally as the ‘Blue Fire’. However, it is only visible during the night. The blue flame phenomena have also been observed at the Dallol Volcano of Ethiopia, where sediment rich in sulfur often ignites, and during forest fires in Yellowstone National Park, USA, where sulfur crusts surrounding hydrothermal vents break apart and ignite. However, these occurrences are not commonplace and do not produce the majestic continuous flow of ‘blue lava’ as observed at Kawah Ijen. 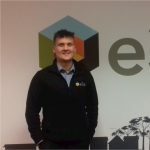 The continued release of sulfur gasses from the volcano has allowed a primitive mining operation to develop around the volcano which collects and sells the solidified sulfur. Ceramic pipes have been installed into the side of the volcano that channels the sulphuric gases from an active vent at the edge of the caldera lake. The sulfur flows down the pipes where it is cooled and poured out onto large sulfur flats. Here it condenses and forms huge areas of solid yellow sulfur. The solid sulfur is mined by a workforce of approximately 300 local Indonesian workers who carry the sulfur down from the mountain by hand, often carrying upwards of 70kg per trip. The workers are provided with little to no protective equipment, using metal poles to break off slabs of sulfur and wet rags over their faces to protect themselves from harmful gasses. Some may be lucky enough to acquire donated gas masks from tourists however there 18p per kilo wage often doesn’t stretch far enough to afford replacement filters. The blue flames Kawah Ijen do provide somewhat of a respite to the miners as they allow them to work at night. The temperature is much lower at night in Java, offering a more hospital environment for the miners to work in. The blue flames, often purposely lit, create a constant, all be it low level, a light source for the workers. The images painted of Kawah Ijen by the photos of the blue lava, and then of the sulfur mine are two heavily contrasting portraits. One offers a glimpse into a heavenly landscape, unbound by the normality of life on Earth. Whereas the latter reveals how the poorest members of the globe must work day and night in harmful conditions, often at the high price of their health, just to afford to send their children to school. 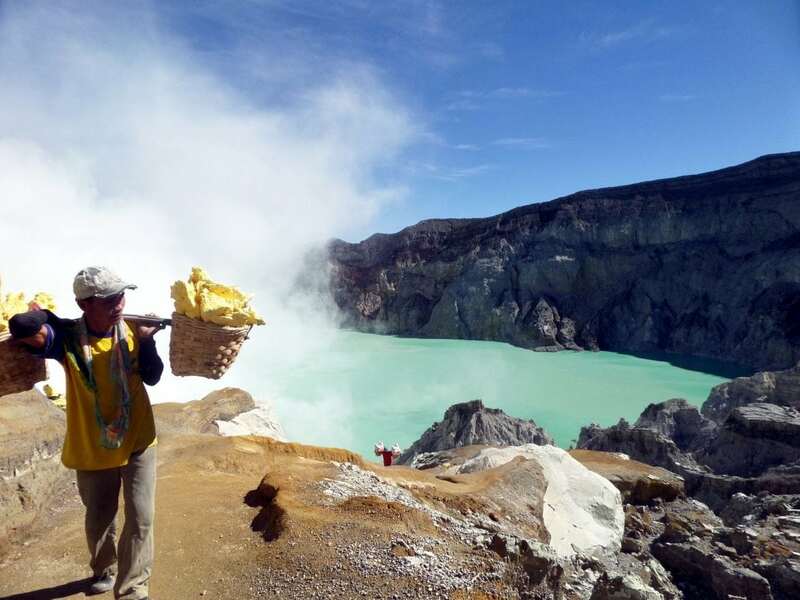 The ‘blue lava’ of Kawah Ijen attracts artistic flare and tourism, whereas the sulfur mines of Kawah Ijen attract the desperate and forgotten.